… a flashmob visits a Spanish unemployment office. Some people have made vast fortunes playing with money. Others have let them do so – by turning a blind eye, either to maintain the status quo, line their pockets, keep their parliamentary seat or preserve the possibility of honours. Although relatively few in numbers, the damage these people have done has had brought countries to their knees. It has affected and is affecting thousands, millions of people. The story I’m about to tell is just one among these millions. It may appear insignificant in the great scheme of things. But for one man and his old dog, their world has shattered. Their story is not unique. Similar scenes are being played out all over Europe. Spain, like many other places, has been badly hit by the recession. People have lost their jobs, their houses. Families have been broken up. One of the consequences is that people are no longer able to keep their pets. So they bring them to the killing stations, abandon them, or in some few cases try to find them a place in rescue centres. The organisation I’m involved with is called ACE – Animal Care Espana, in Southern Spain. 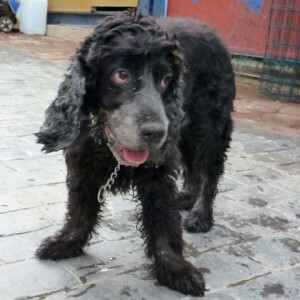 The rescue centre itself is called El Refugio, founded by Fabienne Paques nearly fourteen years ago. Like all the others it’s full to bursting now, with ever more dogs arriving or being dumped at the gates daily. He came to the gate in tears. A young man of about 35. He’d lost his job. As a result his marriage had broken up. His wife had thrown him out with just a backpack and his dog, his Joyma. He had no car. No family he could call on. He’d been trudging from refuge to refuge to ask them to take Joyma. He loved him too much to even think of bringing him to a killing station or to simply abandon him. All the centres were full, besides nobody was willing to take in an old dog. El Refugio is full, over full. But Fabienne couldn’t turn him away. She couldn’t find the young man a home or a job, but she could take his dog. She’d make room. She would give him the only thing she could – the assurance that his Joyma would be well taken care of. It was distressing for everyone, so emotional. Heartbreaking. The dog was drooling in fear – clinging to his master. Don’t leave me. The young man left, weeping. His Joyma is safe and will be found another loving home, but that’s of no interest to the old Cocker Spaniel. For he is grieving, pining for his best friend whom he lost today. As to the young man he too has lost his best friend. He’s lost everything. Tonight he’ll sleep on the street. Alone. This is the human cost of the recession.